Contextual links play a vital role in promoting engagement on your website. They serve as subtle Call-to-actions and entice users to explore your site further if you have captured their interest. To assists your internal links to generate the most benefit for your site, you have to be a bit strategic in the way they are implemented. Simply put, contextual links are links that have been placed within the text of your website. These can be in the ordinary paragraph content of your Blog or landing pages. This does not include links that are placed in Call-to-action buttons. To get the best out of your contextual links make sure they are placed in a natural manner that will make semantic sense for the user to take action. One of the most common mistakes we have seen made is too many links in an article. We have come across web pages that have so many links it looks like your original links got together and multiplied like rabbits! Links are powerful tools! Every time you link to a page you send some of the source page’s authority to the new page. If you have five links on a page, that page’s authority gets split five ways! If you have 500 links on a page, that page’s authority gets split 500 ways. Thus the more you link, the less powerful your links become! Also, too many links look spammy and leave a poor impression on readers. Try and keep links to a minimal and only link where it makes sense and is necessary. Remember the page also features a whole bunch of other links, in the header, the footer, the ads, etc. Your links should be contextually relevant and strategic. Don’t duplicate links; if you linked to a page once in an article, you don’t have to add a link every time you mention the same content. Linking offsite risks the chance of sending users away and not returning. Link offsite only when necessary. If you link offsite, always set a link to open in a new tab, in this way users can still return to your site with ease. If there is an option to link internally as opposed to offsite, opt to link internally. The more natural you anchor text looks the better effect it actually has. Recent experiments have shown you don’t have to use exact match anchor text, the more creative ones work better. Keep your anchor text as natural and contextual as possible. If you have to use more than one word, go ahead. Linking from “best marketing blogs” has more contextual relevance than “blogs”. Read more ore about optmising achor text here. Best way for your links to add value is it for it to be natural! 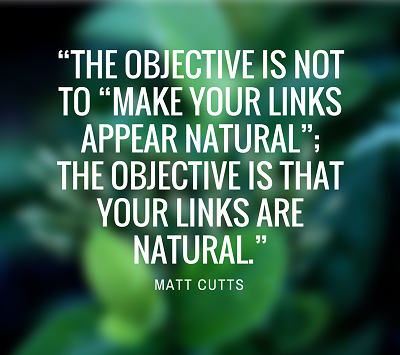 Industry leader and ex-Googler, Matt Cutts, is famously quoted for promoting natural links. In fact, his said more than once, on the record, the more natural and out there your link text is, the more effective it will be.